For almost 50 years, fondue dining at Geja's Café has been a favorite indulgence for Chicagoans as well as out-of-towners. It's a perfect way to kindle romance, celebrate a special occasion, or simply join family and friends for a fun and unforgettable dining experience. So that you enjoy all we have to offer, we suggest Geja's four-course Premiere Dinner. 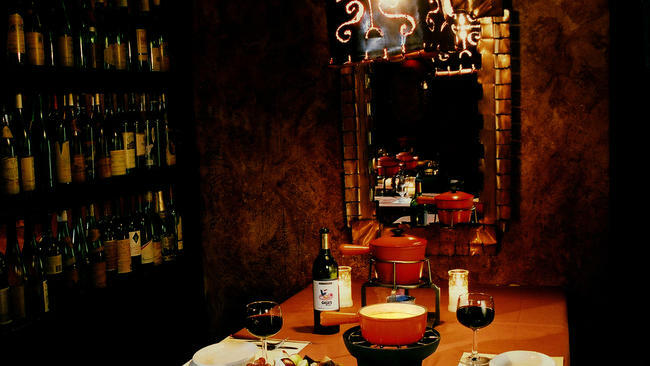 In a candlelit room, surrounded by the music of Spanish and classical guitar, you'll be presented with creamy Swiss Gruyere cheese fondue, melted over an open flame, with fresh breads and fruits for dipping. Our crisp green salad, dressed with tangy Dijon vinaigrette, offers a counterpoint to the rich, warm appetizer. Next, you'll cook your choices of lobster tail, jumbo shrimp, beef tenderloin, sea scallops or chicken breast in a pot of sizzling vegetable oil or broth. This main course is served with a mound of fresh vegetables and eight savory dipping sauces. Our famous chocolate fondue is flamed table-side, and presented with marshmallows for roasting, along with moist pound cake and fresh fruits for dipping into the velvety Belgian chocolate. Geja's Cafe features the ingredients to make your evening an event you'll remember for years to come. Our professional staff will guide you through your dinner, and help you choose the perfect wine to complement your meal. Come find out what has made Geja's Cafe one of Chicago's most admired restaurants for nearly 50 years.